Suzuki Marine builds environmentally friendly four- strokes. 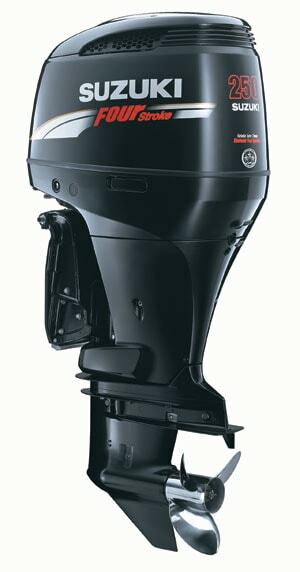 Its DF250 is a narrow-profile four-stroke outboard that's also available in 200- and 225-hp versions. Under the cowling we find variable valve timing, fuel injection, a unique air induction and digital spark ignition. All these technologies combine synergistically to lend the engine the personality of a mild-mannered warhorse. For such a strong performer, the Suzuki runs exceptionally quiet. During testing in the Florida Keys, at mid-range rpm, water slapping against the hull resonated louder than the engine. Predictably, acceleration was strong, and throttle response razor sharp. Because it is a four-stroke, the DF250 has no oil reservoir to fill, though the oil and filter need to be changed about every 80 hours. Finally, consider that some gas truck engines, rated at about the same horsepower as the Suzuki DF250, have never been marinized because they can’t stand up to constant running at wide-open throttle. The Suzuki thrives at 6000 rpm.